During pregnancy it's not uncommon to experience sleep disturbances. These are usually due to hormonal changes, physical discomfort, or anxiety. As your pregnancy progresses, you may find it more difficult to find a comfortable position for sleep. You may also have to make several trips to the bathroom as the pressure continues to mount on your bladder. The following are twelve ways to help ensure that you get a good nights rest during your pregnancy. 1. Routine. Try a nighttime ritual such as having a warm bath, reading, or drinking warm milk. This can increase your body's natural sleep responses. 2. Drink up! Drink plenty of fluids during the day, but cut down before bedtime to minimize frequent nighttime urination. 3. Eat Well. Completely eliminate caffeine and alcohol to prevent insomnia. If nausea is a problem for you, try eating frequent bland snacks such as plain soda crackers throughout the day. Keeping your stomach slightly full helps to calm nausea. Try to eat a well-balanced diet as this is not only is this crucial for you and your baby's health but getting the necessary nutrients will help keep you feeling satisfied and will help you sleep more soundly. 4. Keep moving. Exercise regularly during the day for optimum health, and to improve circulation. This can help reduce those aching nighttime leg cramps. Avoid exercising late in the day though since exercise releases adrenaline that can keep you awake at night. 5. Extra pillows. No matter how you lie, you’ll need extra support to get comfortable, especially by the third trimester. 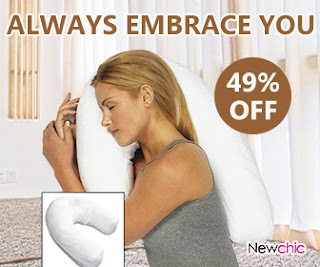 Pregnancy pillows which are full-length body pillows are great for providing extra support. You might also get by just using some extra regular pillows. Try placing pillows under the arms, wedged between knees, or snuggled into your sides. You may have to experiment a little before you find what works. 6. Nap during the day. If you're not getting enough rest at night, take a nap to help reduce fatigue. Find a quiet spot and relax, even if only for half an hour. 7. Reduce stress and anxiety. Stress and anxiety are key culprits in preventing a good night's sleep. Remember that worrying won't help you, but talking about your problems will. Find a friend or a professional who can listen and help you if there are issues in your life that are causing you to worry. 8. Keep heartburn at bay. To prevent heartburn, don't lay down for an hour or two after a meal. Sleep with your head elevated on pillows. Avoid spicy, acidic, or fried foods as they may worsen symptoms. 9. Get some sun. A little natural light exposure during the afternoon will help your body clock understand when you’re supposed to be awake and when you’re supposed to be asleep. 10. Clear the bedroom. Remove the television, computer, mobile phone, and anything else that could stimulate your mind and keep you awake. 11. Proper position. After 20 weeks, sleep on your left side to allow for the best blood flow to the fetus and to your uterus and kidneys. Avoid lying flat on your back. 12. Keep a regular sleep schedule every night. Your body uses light to regulate its sleep/wake cycle. If it gets confused, you could be tossing and turning for hours. Do you have any additional sleep tips for expecting moms? Extra pillows helped me a lot. It was still hard, but the one between my knees helped! I wish I had known this while pregnant! I had terrible sleep towards the end of my pregnancies. The pillows were what help me the most. At then end I slept in a chair though. Extra pillows definitely help! It's good to have the ones that are specifically for pregnant women. It's important to get enough sleep when you're expecting! So these tips are helpful. It's really important that you find what makes you comfortable so that you can sleep better at night. Following a schedule or a routine definitely helps too. I needed all the sleep tips I could get while pregnant. I had the WORST insomnia with both of my pregnancies! I did all that while I was pregnant and it really helps. These are helpful tips for new moms. Just pinned it! These are awesome tips! I remember my mom had a sleep pillow WAAAAY back in the day when I was little, they must work well! I remember when my wife was pregnant and she always had a hard time sleeping through the night as she got closer to delivering. pillows were a big help for her. These are great tips. I had sleeping issues during that time. This will provide great help. I remember naps during the day during my last trimester were so luxurious. I needed them, lol! Heartburn is a big one! I think a lot of women don't realize that some foods are acidic as well, like tomatoes. Great tips! This is probably so helpful. I can't imagine what it's like to deal with all of these things. Def sharing. I know when I was pregnant I had a body pillow that also helped me out a lot! I am sharing this with a friend who just found out she is pregnant with her 1st baby! Yes, extra pillows are a must. So is sleeping on your side. I remember how I struggled with sleeping when I was pregnant. It was a really hot summer and the sleeping was impossible. Extra pillows are a must for sure!